THANK YOU Milford! 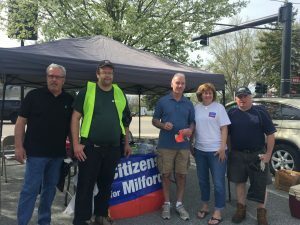 Third Annual Milford Beautification Day Was Another Success! 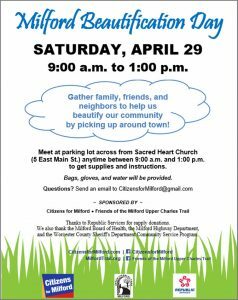 Citizens for Milford organized the Third Annual Milford Beautification Day on Saturday, April 29th, an annual opportunity for area residents, organizations, and businesses to work together to beautify our community by picking up trash around town. Over 100 volunteers put on their gloves, picked up free bags, and helped us pick up trash around our community. Check out our event photo album on here on our Facebook page. The event sponsors are grateful for the assistance and donations provided by the Milford Board of Health, the Milford Highway Department, Republic Services, and the Worcester County Sheriff’s Department Community Service Program. Friends of the Milford Upper Charles Trail is a 501(c)(3) non-profit volunteer organization formed in 2005 to benefit the Town of Milford and surrounding areas, working diligently and in cooperation with the Town of Milford Parks and other departments, various community groups, and interested parties to educate area residents about the recreation and transportation opportunities offered by the Milford section of the trail; promote the use, development, enjoyment, and care of the Milford section of the trail; and raise and expend funds to support trail maintenance and improvements for the benefit of the residents of the Milford area. Information is available on the organization’s website (MilfordTrail.org) and Facebook page.